Getting ready for Saturday, the first dwellings at Edgewater Village. For someone who has been following the long history of this Albany site on the Willamette River, as I have, this weekend marks another milestone. 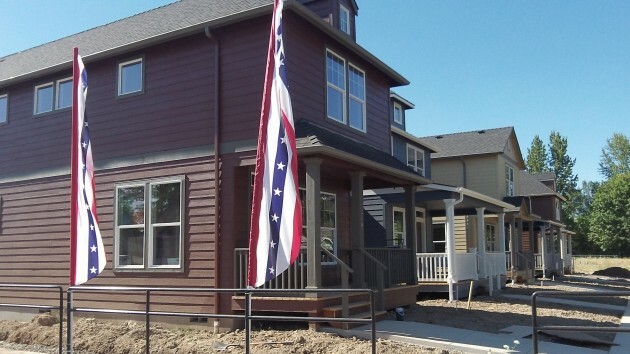 The first five houses of Edgewater Village are finished, beating a deadline, and the public gets a look at them Saturday. The story started in 2006, when an old packing plant on the property burned to the ground. Because nobody else did, the city had to clean up the ruins. The Central Albany Revitalization Area solicited private developers, and after years of changing plans and other complications, the current plans for the 60-lot Edgewater Village subdivision were approved. The first five dwellings had to be completed by the end of this month under revised deadlines set by CARA, which invested a total of $2.4 million in the development, starting with the initial cleanup of the site. Now, it’s time for a grand opening, scheduled from 9 to 5 Saturday. The address is 206 Main St. N.E., though presumably each of the five houses has a different number. The entire site measures between 5 and 6 acres and is bounded by Main Street, the Portland & Western tracks along Water Avenue, the Lafayette Street trestle and the Dave Clark riverside path along the Willamette. Like any subdivision at the start of development, the site still looks pretty raw. The buyers of the first houses will have to hope that the rest of the acreage gets developed soon. The view across Water Avenue and the Portland & Western track. So, Albany taxpayers will give the developer $40,000 for each the 60 units. Given such a huge advantage in the marketplace, will the developer list these houses at a competitive price? It doesn’t appear so. Per the Windmere Realty site, it looks like the first units will list for $255-$279K, or $148-$169 per square foot. The houses range from 1580SF to 1888SF. For someone like me, who plans to sell a more attractive, non-downtown, non-subsidized house in a better location, this is great news. 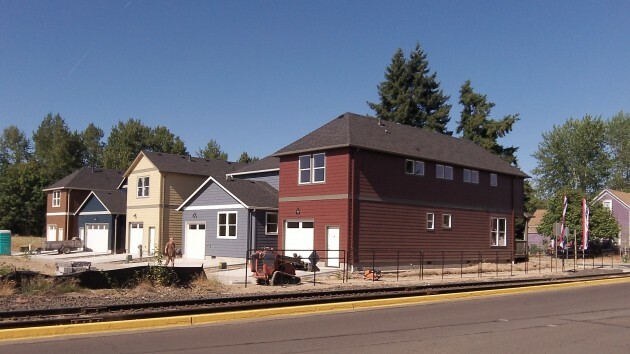 For me the taxpayer, I’m disgusted that we gave a Lake Oswego developer a pile of property tax money to build ugly houses in a less than ideal location. The city council better hope that there are 60 suckers willing to pay a premium to live downtown. It will be a city-wide embarrassment if this “investment” ends in failure. 255K-279K ??? This guy NEEDS LUCK and I’m predicting that we, the taxpayers, are going to be sucking on this deal for a long time. One benefit: The potential owners can do all landscaping maintenance in about 3 minutes per week! This “development” puts new meaning to the phrase “postage stamp sized yard.” I live within 3 blocks of this place and am NOT impressed. This deal needs prayer, Hasso…….Luck won’t cut it. Nothing quite like reading the ongoing consistency of the radical right: hate, division, mischaracterization and bombast. Perfect prelude to the Donald tonight, and the rest of republican candidates. I don’t know what your post has to do with the development at Edgewater, other than to provide you with an opportunity to paint conservatives and Republicans with a very broad brush because we don’t think this CARA project was well thought out. It demands a response. Bob, if you weren’t so far left we wouldn’t appear to be radical to you. I suggest YOU are the radical here. To you, government has the answer for every one of society’s ills and can do no wrong. Since when is demanding accountability from our public officials radical? You have it backwards Bob…..in this nation, government is designed to serve the People, not the People serving the government…..as we now have. You aren’t part of the solution Bob…you’re part of the problem and you have a lot of company on the radical left. When you point fingers at others Bob, remember that three of them point right back to you. Hate? I don’t hate anybody. That’s a FALSE ACCUSATION and a total mischaracterization of what conservatives stand for. Accusing someone of hate REQUIRES hate on the part of the accuser. Get the picture there Bob? Division? What the hell are you talking about? Mischaracterization is YOUR SPECIALTY. And if expressing one’s opinion is bombast, then you are as bombastic as anyone here, and without question the most condescending. All you do is parrot liberal (“statist” to be more accurate) talking points that we’ve heard so many times from people smarter than you, Bob. Finally….CONSISTENCY. YES, Bob….we conservatives are consistent. Consistent in our beliefs, our morals, and our belief in liberty. Liberals such as yourself think everything is relative. My question for you is….relative to WHAT? Certainly not relative to what our founders had in mind….not even close! Do you know what the opposite of liberty is, Bob? It is tyranny. I predict our next POTUS will be on display tonight. Without doubt you support Hillary, the serial liar….or Bernie, the self-described socialist. At least Bernie is honest about who and what he is. The chairman of the Democrat National Commitee (Wasserman-Schultz) couldn’t even define the difference between a socialist and a Democrat when asked by Chris Matthews the other day. She looked like a deer standing in front of a Peterbuilt and tried to dodge the question. Did you miss that one, Bob? Chris Matthews rarely gets kudos from me but he did there. Trump is not the candidate I will vote for in a primary but he would be quite an improvement over the Community Organizer In Chief that now inhabits the White House. Bob, with your vast knowledge perhaps you would make a fine POTUS, at least in your own mind?